We are glad to announce the release of new .NET CF GUI component – MonthCalendar. 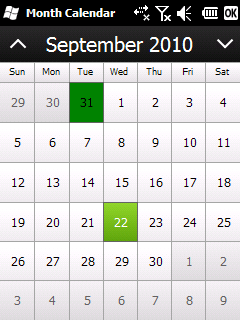 It is useful for prompting users to choose a date – particularly a day within month. The user can navigate forwards and backwards between the current and next or previous month using his finger. MonthCalendar animates the transition between the months giving the application appealing look. You can also highlight holidays and planned appointments in the calendar. To find out more information and try out the trial version click here.